When I received the InnoFLASK portable speaker ($129.95) $88.43, the first music I played was my long-time favorite: Rimsky-Korsakov’s Russian Easter Overture. It has a wide dynamic range, and seemed like a perfect test for this speaker. I was impressed. I’ve listened to this composition many times over the years on many different stereo systems. It’s a good test because Rimsky-Korsakov uses such colorful orchestration and dynamic range, from a single flute to the full orchestra playing fortissimo. Often when I’d listen to it, the solo passages would be almost inaudible. If I cranked up the volume, the fortissimo passages toward the end would be too loud or would distort. I’m not a connoisseur of speakers, and this is my first Bluetooth portable speaker, so I don’t have a basis for comparison, but the InnoFlask handled the task well. I turned up the InnoFlask to full volume and could hear the quiet solo passages clearly. Yet there was no distortion in the loudest parts of the work. Every level was satisfying. The fortissimo felt full bodied but not overly loud. The InnoFlask can fill a room with sound. And I can hear it well enough in the next room to continue enjoying the music if I’m moving around the house. Certainly it’s not a full-fledged stereo, but if you need portability it seems a good choice. And for me, it’s a perfect choice. I like to live lean, with not a lot of big toys in my environment. I’ve never wanted a component system, with large speakers and wires. It felt like clutter. The InnoFlask fits my lifestyle. The music satisfies, yet it takes up little space. 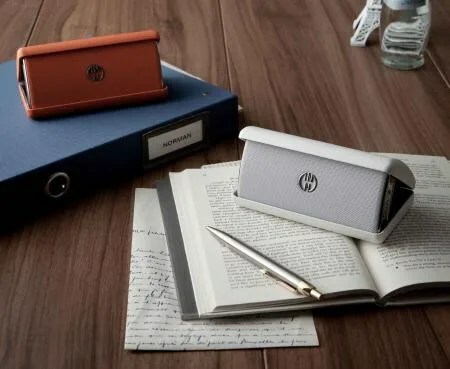 The design is attractive, and includes a speaker and a solid case. You can throw InnoFlask in a backpack or purse, or put it in a pocket, and not worry about damage. 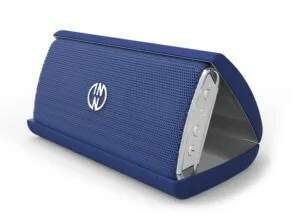 The case is about the size of a glasses case and the speaker and case weigh less than a pound. You can also conveniently use the case as a stand for the speaker. Setup was simple. I had it paired with my iPad in a couple minutes without reading the directions, though I did glance at the Quick Guide on the packaging. The InnoFlask gives helpful sounds to let you know its status, such as when it’s connected. The volume buttons double as track-up and track-down buttons, while the pairing button doubles as a play-pause button. The InnoFlask comes in black, blue, orange, and white, and retails for $129.95. It’s currently available for less than $90 on Amazon. (I was lucky to receive a free evaluation unit.) The package includes speaker, case, charging cable, and manual. The InnoFlask is highly portable, attractive, and can fill a room. It handles a wide dynamic range with aplomb. Being a small portable speaker, it won’t fill a whole house with music. The InnoFlast seems a good choice. This entry was posted in Apple news and tagged InnoFlask, iRumors Store, iStore, Portable Bluetooth Speaker. Bookmark the permalink. Dropped iPhone 5 films its watery descent to the ocean floor.